Nørretranders caption: Küpfmuller's diagram of the information flow through a human being: from the senses through the brain (and consciousness) to the motor apparatus. 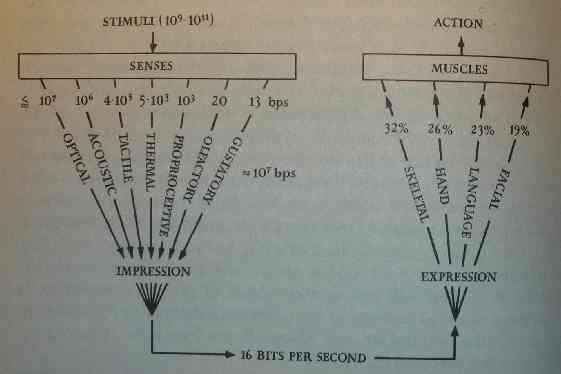 The thick line shows how many million bits from the senses are sent via nerve connections to the brain, which has a very high bandwidth. From the brain the information is sent to the body, which manages about the same amount of information as the senses receive. The thin line shows how the consciousness processes a very little proportion of this information. I've written previously about The user illusion, cutting consciousness down to size by Tor Nørretranders. The diagrams and captions above and below are taken from the book's sixth chapter "The Bandwidth of Consciousness", and for me they and the evidence that Nørretranders presents are a revelation, in that they emphasise how little we can consciously take in at a time; and hence how designers of e-learning materials need to avoid creating cognitive overload. 25 November 2012 note. Today this 5.5 year old post was linked to from Ycombinator, causing a large spike in traffic. You may want to read and possibly contribute to the discussion that has developed there. Nørretranders caption: An overview of the information flow through a human being, drawn by up by the Erlangen School (Frank, Lehrl, er al.). A so-called organogram. 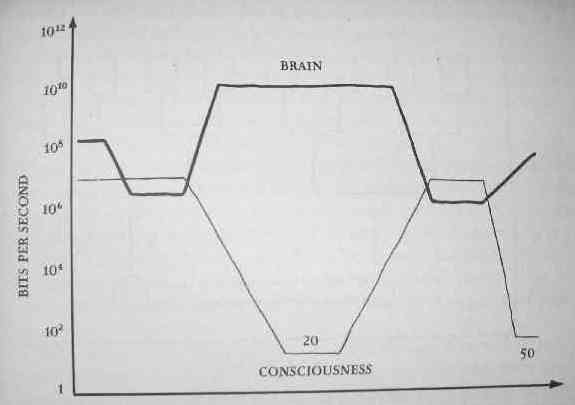 Just as Küpfmuller's diagram it shows that more information goes in and out of humans than consciousness perceives. Excellent diagrams that are worth following up in this truly wonderful, and shocking, book. The limitations of consciousness are laid bare with relentless efficiency. We're selective, rejecting and discarding data in a process of severe information reduction. Our attention is limited, memories limited and consciousness is a sort of fraudulent interpretative spotlight. The book changes your entire view of the mind, how we perceive, and the status of consciousness. It's also full of amusing and relevant anecdotes and stories. I loved the one about Victor Hugo. After writing Les Miserables, he went on a deserved holiday. Unable to resist finding out about his book sales he wrote a letter to his publisher - it simply said '?'. His publisher replied '!'. Must be the shortest text dialogue ever? There is an increasing body of evidence that only a minuscule proportion of the sensory data processed by the unconscious mind (capable of processing approximately 11 million bits per second) is referred to the conscious mind (capable of processing approximately 50 bits per second). It is also clear that conscious awareness of stimuli from the environment lags actual perception by approximately half a second, but that a backward referral of subjective experience results in a individual's perception of the stimulus and its conscious awareness as simultaneous. These findings challenge the primacy and supremacy of conscious processing of information on which a substantial proportion of educational practice and policy is based, and suggest a re-evaluation of the the nature of teacher competence and expertise.